Few details about the deaths of Jenna Scott and Michael Swearingin have been made public, but an arrest warrant affidavit shines some light on when and where the two lost their lives. 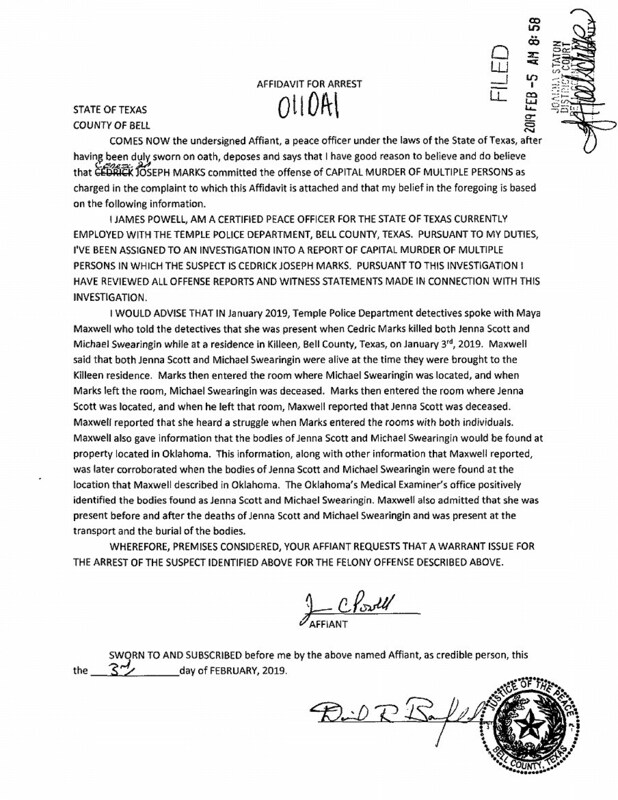 According to the affidavit, 26-year-old Maya Renee Maxwell (currently in the Bell County Jail charged with tampering with physical evidence) told investigators she was with 44-year-old Cedric Marks at a home in Killeen on January 3 where Scott, who'd previously dated Marks, and her close friend, Swearingin, were killed. Maxwell said Scott and Swearingin were alive when they were brought into the home. She told police she saw Marks enter a room in which Swearingin was located, then heard a struggle. Maxwell said Swearingin was dead when Marks left that room. Maxwell said she saw Marks enter a room in which Scott was located, and again heard a struggle. Scott was dead when Marks left the room, Maxwell said. Scott and Swearingin's bodies were found buried on a rural property in Okfuskee County, Oklahoma on January 15. According to the affidavit, Maxwell told police where the bodies would be found and admitted to being present when the victims' remains were being transported and buried. Maxwell was arrested on January 11 after she reportedly admitted to moving Swearingin's vehicle to Austin in hopes of concealing it from police. On Sunday, February 3, Marks escaped the custody of private prison transfer firm Texas Prisoner Transport Services during a lunch stop in Conroe. He led police on a nearly 9-hour manhunt before being recaptured. Marks was later booked into the Bell County Jail, where he remained Tuesday in lieu of totaling $1,766,500. He's been charged with capital murder of multiple persons, interference with an emergency call, filing a false report to police, violating a protective order, and burglary of a habitation. Marks' wife, 37-year-old Ginell McDonough, was arrested on January 11 in Muskegon, Michigan for harboring a fugitive. According to an article from Stars and Stripes, McDonough is suspected of harboring Marks and Maxwell.